Gucci Sunglasses, Highest quality prescription Rx - Eyeglasses.com since 1999. Gucci sunglasses have been relaunched, and we now have the 2017 collection! All Gucci eyewear made in 2016 and before is now discontinued. 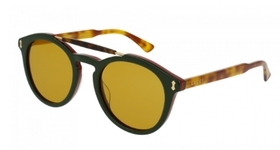 The new collection, by Kering Eyewear, continue the great Gucci tradition, but in a more fabulous direction. 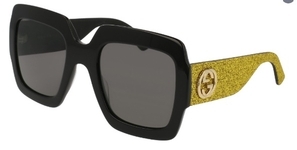 Gucci sunglasses have long been heralded as the ultimate in fashion accessories. What could compare with a stylish pair of Gucci sunglasses over a white tee shirt and jeans, or the most expensive runway dress? Gucci sunglasses has set the fashion standard, to the point that it really makes no difference which pair of Gucci sunglasses you are wearing. To be sure, you must wear the Gucci model that you feel best in. But let’s be realistic, do you really think it matters which Gucci sunglasses model you choose? Follow this link to see the official website of Gucci.